This is one of those recipes that I have been making for years and years. I honestly couldn’t believe I had never shared it with you. I have always liked this breakfast pizza, but since our home is gluten free most of the time it has definitely moved up in rank. I love that this recipe is so versatile. Once you have the hashbrown crust and the scrambled eggs, on top the rest of the ingredients are endless. I love to do sausage, peppers, and cheese for a more traditional breakfast; however, if I am looking for something a little different I chop up some turkey lunch meat, and throw some avocados on top to have a twist that is still quite delicious. Here are some of my favorites but top with anything you like. Cover a round stone baking sheet with parchment paper. 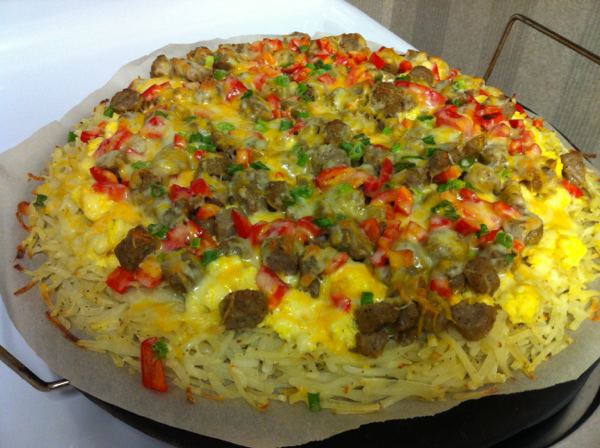 Combine hashbrowns, egg, and salt and pepper together and spread into a 14-inch circle on the stone pan. Bake for 10 minutes. Remove from oven and set aside. Scramble and cook the eggs together with the 1/2 cup milk until they are soft but cooked through. (This can be done either on the stovetop or in the microwave.) Once the eggs are cooked Spread them over the potato crust. Top with remaining topping ingredients of your choice and shredded cheese. Cook an additional 10 minutes. Cut into wedges and serve. 3 Comments on "Breakfast Pizza"
Oh I love breakfast pizza! YUM!! Just in time! I’m hosting a group of women at my house this Saturday morning and have been looking for a new recipe. Thanks for sharing! I’m thinking country ham and sliced roma tomatoes! YUMMY!